The world is about to see Europe linked to South America in a way that has never happened before. A bridge will link French Guiana, the last European outpost in the Americas, with Brazil, the largest country in South America and now the sixth largest economy in the world. There are other physical links to Brazil, but none from Europe. Once the bridge between French Guiana and Brazil is opened, so too will open the opportunity for greater trade and investment between the European Union (EU) and Brazil, since for all administrative purposes French Guiana is as much a part of France as Paris. French President Nicolas Sarkozy, whose country is just ahead of Brazil in the rankings of the world’s largest economies, will probably announce the opening of the bridge across the Oyapock River, French Guiana’s border with Brazil, while he is in French Guiana as part of a campaign whipping up support for his shot at a second term as President. His interest in the relationship between French Guiana and Brazil will go beyond the physical link between the two neighbours to the economic opportunities it can provide for France and by extension the EU. Brazil has a population of about 200 million and its economy grew by 7.5% in 2010, and was forecast to grow another 3.5% in 2011. It is rich in natural resources and is open to European investment. On the other side, Brazil has a vibrant manufacturing sector and, remarkably, it sells more to China than it imports. For Brazil, the link to French Guiana could lead to a direct land-crossing to the Atlantic Ocean for parts of its huge territory from which overland transportation to its own Atlantic coast is expensive. This possibility will be additional to a border-crossing established in 2009 between Brazil and Guyana, when a bridge was built over the Takutu River that barely divides the two countries at Brazil’s northern point. However, while the bridge accommodates regular traffic between Brazil’s northern area, Roraima, and Guyana, there is not an all-weather road from the bridge to Guyana’s coast. Until the all-weather road is constructed, Brazil still cannot use Guyana effectively for transporting exports from its northern region. If French Guiana opens the 1,240-ft-long bridge for business, it will connect the towns of Saint-Georges-de-l’Oyapock and Oiapoque on the French and Brazilian sides, and the opportunities for commerce not only between the two neighbours, but between France and Brazil will expand rapidly. The opening of this bridge need not rival or displace the already-opened link between Guyana and Brazil, provided an all-weather road, estimated at US$40 million, is built from the Guyana border town, Lethem, to Guyana’s Atlantic coast. Guyana’s Foreign Minister, Carolyn Rodrigues-Birkett, recently announced that Guyana has completed a feasibility study for the Lethem Road paving project. She is reported to have said: “We would like to see this project accelerate quickly, but we also have to be very patient.” While she did not say so, the Minister’s caution could be based on the level of concessional financing that Brazil is willing to give. Meantime, authoritative reports show that, as a result of the Takutu Bridge, the flow of commodities from Guyana to Brazil has increased. There is also a flow of Brazilians into Guyana especially into the gold and diamond mining industries, and, increasingly, into the establishment of nightclubs and restaurants in Guyana’s capital city. The completed road would not only give Guyana an opportunity to sell commodities to Northern Brazil, it would also earn Guyana revenues from Brazilian exports moving to Guyana’s sea port which would have to be converted into a deep water harbour. Services to Brazilian transport vehicles would also provide new economic opportunities for Guyanese and very likely lead to new townships along the hundreds of miles of road. If the Brazilians extend their cooperation further to provide concessional financing for a deep water port in Guyana, both countries would benefit. So too, would the countries of the Caribbean Community (CARICOM), whose people would find jobs in an expanded Guyana economy, and whose manufacturing industries could access Northern Brazil through Guyana. 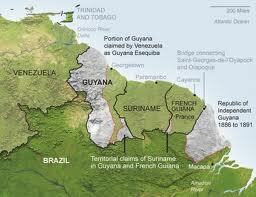 The Guyana-Brazil relationship would have to be carefully negotiated to ensure that Guyana is not overwhelmed. While there is no tension between Guyana and Brazil, some of Brazil’s other neighbours in South America – particularly Bolivia and Paraguay – have complained about Brazil flexing its newfound political and economic muscle. Marcel Biato, Brazil’s ambassador to Bolivia, said, about infrastructure financing in Bolivia and elsewhere in South America, “We want Brazil to be surrounded by prosperous, stable countries”. Other Brazilian authorities have argued that their country has access to sources of raw materials other than its immediate neighbours and that it has routes across the continent through which it can send goods to ports on the Pacific. That may be so, but it is cheaper for Brazil to secure raw materials it needs from their closest point, and the Governor of Roraima has made it clear that it would be cheaper for manufacturing industries in his State to be able to ship their goods to the Atlantic through Guyana. It is very much in Brazil’s interest to allay the fears of its neighbours and to monitor carefully the behaviour of some of its companies operating in nearby countries, or, over time, it could be tainted with the same image of bullying that Latin American and Caribbean countries applied to the United States. That would not be good for Brazil or its neighbours. As the Brazilian economic ship rises in the sea of economic fortunes it has the chance to pull along the smaller economies around it in a manner that commands respect and support. The bridges to two of the Guianas – Guyana and French Guiana – as well as the increasing economic links to the third of the Guianas – Suriname – offer great opportunities for Brazil. As for Guyana, the all-weather road to Brazil will be a catalyst for further economic growth and a gateway to South America for the Caribbean Community countries. As two developing countries with shared interests in the international arena, Guyana and Brazil should cement a fair, balanced and co-operative agreement to ensure mutual benefits and gains whatever happens with the connection between France and Brazil through the use of French Guiana.